“What is my job? Midfielder, win the ball and give a good pass”. Words of Arsenal Manager, Arsene Wenger. The midfield is the most important department of a football team. It’s the engine of a team and we know how valuable an engine is to a vehicle. When the midfield is dysfunctional, both the attack and the defence suffers greatly. The attackers are unable to get the ball and when you don’t have the ball you cannot score or win. The defence on the other hand is also under severe pressure because the opposition has them in the back foot with incessant attacks. So with this mini refresher course on Midfield 101, we ask, how did our midfielders rank this season? Well, Our midfielders were just a carbon copy of our season. As our midfield play improved, the team’s performance improved. Much has been said of our travails early in the season, how we dropped valuable points especially at Home to Abia Warriors and to Giwa FC as well as our failed CAF Champions League campaign. Those early days were characterized by missing out the basics of midfield play. Aside being unable to keep possession well in games, our movement on and off the ball was awful in some of those games. Then, pumping hopeful balls upfront characterized our play often too such that the strikers are basically fed crumbs in games. In the goalless draw with Giwa FC, sights of the likes of Mfon Udoh and Abdulrahman Bashri running back into the midfield to get the ball was too common. The lack of quality in the midfield at that time was so poor such that when ex Super Eagles midfielder Sani Kaita became available for a couple of months, he slotted into the team seamlessly as nobody could match what he brings to the table. The midfielder missed that infamous game against Giwa FC on grounds of injury. Sadly, the midfielder would open up to me that those claims of an injury were false and that some people did not want him to play. If you don’t want your best midfielder to play for whatever reason, do you have a better alternative? No was the answer as we saw in that game. Well that decision ultimately cost Enyimba 2 points at home and Zachary Baraje his job. Things improved with the appointment of Kadiri Ikhana. There was a renewed zeal among the players especially the midfielders as they realized they needed to step up their game. Among the notable changes from the team in the second period was the liberation of Nzube Anaezemba. So many people in the country know of Sokari Kingsley whose displays earned him a call to the Super Eagles but few know Anaezemba. Diminutive, quick and intelligent on the ball. Modric as he is called by both his team mates and the fans, the midfielder got 4 goals in the second half of the season. Vitals goals too and his celebration? Drogba-sque! Pumping his hands in opposite directions. Talking of goals, it is always essential that the midfield comes up with goals when the strikers are finding it difficult to do so and in the second half of the season especially, the midfielders came good in this area. Aside his impressive goal hurl in the Federations Cup knockout rounds, Sokari Kingsley scored a vital away goal that got all three points against Kaduna United. Rasheed Olabiyi fired a “wonder goal” winner against Abia Warriors in Umuahia and Etor Daniel made the game safe against FC Taraba. 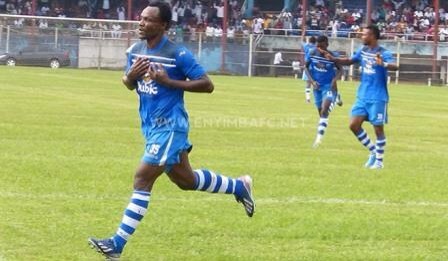 The best we saw this season from a midfielder at the Enyimba Stadium was Kaita’s sumptuous volley against Kaduna United. With scores tied at 0-0, Kaita fired in from over 30 yards to make the game safe. Defensively, our longest serving player Rasheed Olabiyi did a yeoman’s job in many a game this season. Razak Aliyu when deputizing also ensured he used his physical presence very well to cut out alien attacks. It is also very good to see that they indeed learnt a thing or two from Sani Kaita. Kaita always attempted those “over-the-top” balls for the strikers to run onto and in the 4-1 drubbing of Bayelsa United for instance, we saw the midfielders trying those. One of those resulted in one of the goals we scored that day. Finally for my rating, I will begin by saying that just like every area of the team, the midfield needs to improve even further in the coming season as a side desperate for League glory. No doubt some will not remain with us next season as their contributions were insignificant. However our second-half-of-the-season displays ought to be the benchmark for the coming season. And on the basis of this, I give a B rating to our midfield. Next postEnd of Season Report card. Part IV The Attackers.